But Kerry didn’t weigh in on perhaps the biggest obstacle to Inslee’s plan: deciding where revenue from the proposed $10-per-ton tax on carbon should go. OLYMPIA — Former United States Secretary of State John Kerry stopped by the state Capitol on Tuesday to urge Washington lawmakers to support Gov. Jay Inslee’s carbon-tax proposal. Lawmakers and environmental groups over the years have had deep philosophical differences about that question. In a news conference outside the Capitol building, Kerry said he wouldn’t get involved in negotiations. “But it’s always an element of compromise,” said Kerry, a former U.S. senator from Massachusetts and candidate for president. If Inslee wants to get his carbon-tax plan passed, it could take a lot of compromise. The proposal, SB 6203, includes dozens of exemptions for industries that could be affected and is expected to raise prices for gasoline, electricity and natural gas. Advanced by Sen. Reuven Carlyle, D-Seattle, the plan would put tax revenue toward water and forest projects to reduce the effects of climate change and also offer tax credits for utilities to make investments in clean energy. It also would fund rural economic development and some transportation projects and provide community assistance to offset the cost. If approved, Washington would be the first state in the nation to use a carbon tax to put a price on greenhouse-gas emissions. Elsewhere in North America, British Columbia pioneered a carbon tax that started at $10 a ton (Canadian dollars) and rose over the years to $30 a ton. The British Columbia tax has adapted a revenue-neutral approach that was accompanied by cuts in corporate and income taxes. The cuts are supposed to grow along with the carbon tax, and help people with the escalating economic bite as they pay more for fossil fuel products. In Washington, a failed 2016 ballot initiative proposed a revenue-neutral carbon tax. Some environmental groups opposed it, in part, because it didn’t raise money for renewable energy and climate-related programs. Elsewhere in America, the revenue-neutral approach has attracted some Republican support, including former South Carolina congressman Bob Inglis, who heads the nonprofit RepublicEn, which educates people about climate change and a carbon tax. Inslee’s plan passed one committee vote earlier this month and is scheduled for a hearing Thursday in the Senate Ways and Means Committee. But legislative leaders have been cool to the prospect of advancing the proposal. Since Inslee’s plan would hike gas prices, that money should go to transportation projects such as buses, rail lines and the ferry system, said Sen. Steve Hobbs, D-Lake Stevens. Those projects would both reduce carbon and boost quality of life, said Hobbs, who voted against the proposal in committee. Meanwhile, Democratic House Majority Leader Pat Sullivan of Covington has said he believes any carbon-tax revenue should offset the costs of higher energy prices. Senate Republican Floor Leader Joe Fain of Auburn said he’s had conversations with both Carlyle and Inslee’s office. But, “I’m pretty resistant to it right now,” he said. Fain said he supported the 2016 carbon-tax initiative, I-732,and would be more interested in British Columbia’s approach. “There is a space for a real conversation about tax relief that could be folded into this conversation,” Fain said. Sen. John Braun, R-Centralia, has, in the past, entertained the notion of a carbon tax that funds water projects dealing with issues like flooding and water storage. But Braun, ranking Republican on the Senate Ways and Means Committee, also said tax reform must be included to offset increased energy costs. This year, a new ballot initiative campaign is expected if the Legislature fails to pass a carbon tax. That measure would raise money for clean-energy programs and make communities more climate resilient, said Becky Kelley, president of the Washington Environmental Council. Kelley said the alliance working on the initiative hasn’t yet settled on a carbon price. 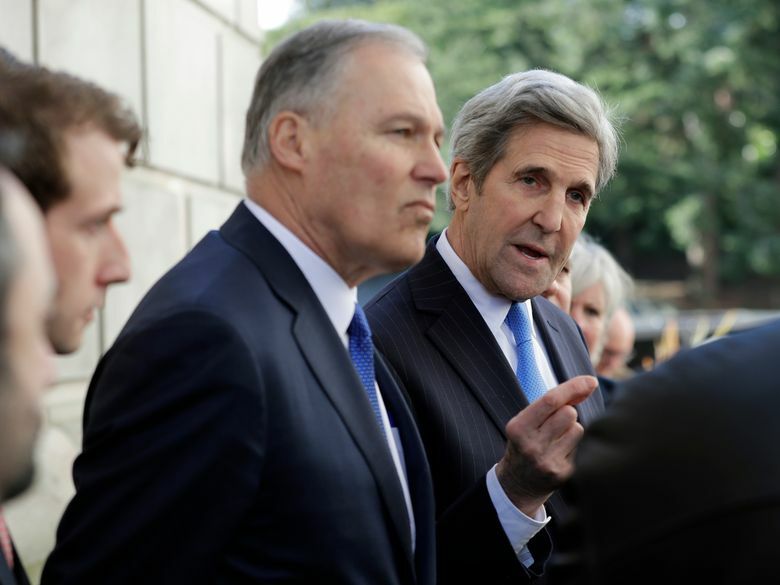 An Inslee spokeswoman said Kerry’s trip was not paid for by the state.